2013 Romp to Stomp – New Jersey raised $45,000 for the fight against breast cancer. Thank you to the Shred Loves Pink team for contributing and helping to raise awareness of breast cancer. In May, we will be in Philly for the walk on Mother’s Day. Hope to see you in Philly and/or stompin’ with us in 2014! No pink ‘staches for the guys? 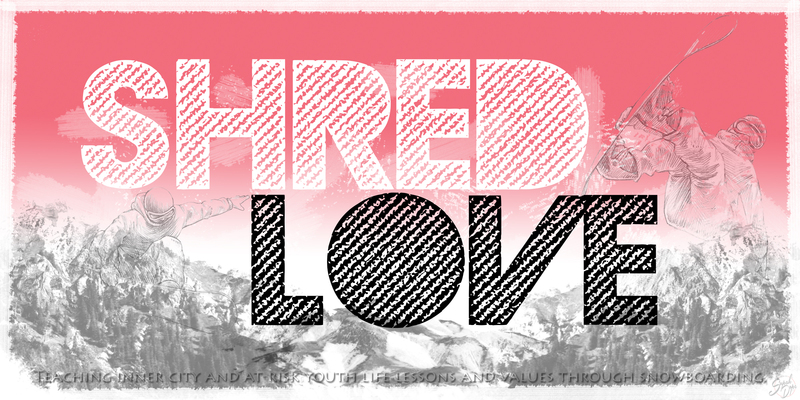 Shred Love is once again joining Tubbs’ annual Romp to Stomp Breast Cancer snowshoe event! Join us on Saturday, January 19, 2013, at Mountain Creek in Vernon, NJ for the 3k snowshoe walk to help raise awareness to breast cancer and raise money for Susan G. Komen. Sign up now to take advantage of discounted registration fees, our team name is Shred Loves Pink. Read about our snowshoe experience last year here. Missed us? I bet you did. Blame it on the old faulty laptop and not the warm temps Mother Nature has blessed us with, because it hasn’t stopped us. On January 21st, Shred Love participated in its first snowshoe event. It was also the first snowfall this winter, dumping about 5 inches in New Jersey. We made our way to Mountain Creek, to take part in Tubbs’ Romp to Stomp to help fight breast cancer. Factor in the snow falling and Creek’s powerful snow guns, the walk felt more like an action pack trek through Alaska. Don’t believe me? See for yourself. See the looks on their faces? LOL, it just hit them how much further we had to go to the finish line and that we should have brought our boards along with us to ride some of the fresh powder. At the finish line, winners were announced and everyone took a moment to remember those who lost the battle against breast cancer, as well survivors. Even though Shred Love is a youth-based organization, we felt it was important to support this cause as it affects so many. Going in, we knew we wouldn’t be able to wipe out breast cancer completely, instead we raised money and awareness for the cause, with the hopes of contributing in the progress in finding a cure. Please consider joining us next year, January 2013. Sunday, 2/27 officially marked the end of our snowboarding season. To say it has been great, is an understatement! Over a total of 6 days (7 days if you count our photo shoot at The Hidden Valley Club), we visited 3 different mountains, served 40 students, and made a bunch of life long memories. I would like to thank everyone for making this a huge success! With everyone’s dedication, we were able to make such a great impact on the youth’s life, as well as our own. The experience as a whole was great for both the participants and the volunteers. As we worked with the students on linking turns, safely loading and unloading the chairlift, we were able to gain a greater insight into how patience and consistency plays a role into developing solid relationships. I know that sounds like common sense, but with the fast pace of life, we sometimes forget the value in making people a priority. It was also great reconnecting with our friends at Windham Mountain, as well as making new friends at The Hidden Valley Club, Mountain Creek and Anchor House. In addition, with the tremendous support of the instructors at the mountains, Snowboard Addiction and Aratik USA, our group was able to take their riding to the next level. More students ventured on to the chairlift, to the top of the mountain, and in racing (snowboard cross). Therefore, it is my pleasure to present to you our graduating class! Not pictured – Nathaniel, Isaac, Marcel, Xavier, and Malik. Congratulations! And to the world’s best volunteers, thank you! Not pictured – Rhosheema and Rob, thanks for your support! In the spirit of World Snowboard Day, Mountain Creek declared Monday, December 20th Go Snowboarding Day! Go Snowboarding Day gave hundreds of people the opportunity to become life long riders by taking advantage of Mountain Creek’s learn to ride package: lift tickets, rental equipment, and a 1.5 hour long lesson for FREE! So when Mountain Creek extended an invite to us to attend an evening session, we jumped at the opportunity. It was the perfect night for Shred Love to start off the 2010-2011 season; the conditions at the mountain were perfect, the participants were pumped to get back on their boards, and it was our board member, Mel‘s birthday. Did I mention we had the school yard to ourselves? Yeah, it was pretty sweet! Masz was the only beginner volunteer. Our other volunteers were happy for the refresher and to be back out with the group. He wasn’t the only beginner, so was Nicky. Here are more pictures of everyone, enjoy! Check out all of our pictures at Facebook. Check out Mountain Creek’s video here. Go Snowboarding Day at Mountain Creek! To be a part of Go Snowboarding Day, please send us an email at info@shredlove.org/wordpress with “Go Snowboarding Day” as the subject. Please indicate if you will need gear (snow jacket, gloves, and/or snow pants) and rental equipment (boots and snowboard). This event is limited to our participants ages 8-18 and our volunteers/mentors. Act fast! Registration ends Wednesday, December 1, 2010. Promptly departing Bayonne, NJ at 4pm.